If you love horses, be sure to include horseback riding at one of the horse farms when you stay at the Inn at Monticello. Charlottesville has some beautiful horse farms that offer different ways to enjoy riding horses. Take a look at what the area has to offer. Located in Earlysville, Patty Swygert has Mahalo Farm, 97 acres devoted to all things equestrian. She bought the farm in 2000 and cleared miles of barbed wire and brush to create riding rings, fencing, a TREC and cross country course. 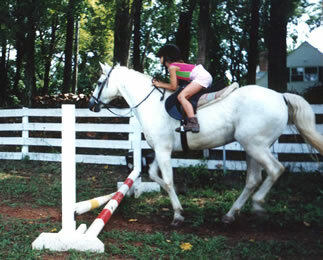 Mahalo Farm has a medium-sized riding ring with all-weather lights, track, jumps, and barrel. With an all-weather round pen and lights, there’s a full-sized grass dressage arena, tack shed, huge barn and multiple run-in sheds. The farm boasts beautiful bottomland pasture, woods, cross country jumps and farm trails, as well as a regulation water jump and TREC obstacles. Sign up for a trail ride for an hour, half-day, or all day! At Carriage Hill Farm in Keswick, you’ll find just the right horse or pony for your skill level. Whether you come to improve your skills or just to enjoy a ride in the country air, you’re in good hands with Kristi O’Donnell. She’s a certified horse trainer and instructor and has taught hundreds of adults and children basic riding skills and good horsemanship. All equipment is provided. Just bring shoes with heels. In Orange, VA, you’ll find Oakland Heights Farm, which includes two riding rings, miles of riding trails, and quaint stables.This horse farm offers both Western and English lessons 6 days each week, year round. Trail rides are available every day of the week. Oakland Heights Farm has absolutely beautiful countryside, so you’ll enjoy both the ride and the view. The farm also holds horse shows from April through October. These shows are both VHSA and BHSA recognized for member points. And if you love a good rodeo, you’ll find some of the best bull riding events there on the second Saturday of each month, May through September. Make your reservation with the Inn at Monticello and enjoy your ride!